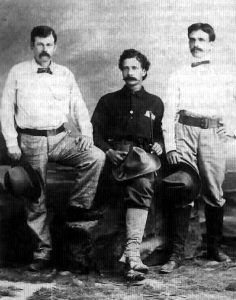 The John Kinney Gang, also known as the Rio Grande Posse, were successful cattle rustlers and hired gunmen who primarily operated in Dona Ana County, New Mexico in the early 1870s. The gang was organized by John Kinney and in addition to cattle rustling, they also committed acts of robbery. Upon their arrival in Lincoln County, John Kinney was deputized by Sheriff George Peppin to counter Billy the Kid and his “Regulators“. With his gang acting as a posse, Kinney and his men were given the freedom to run rampant in the county. At the same time, former Kinney Gang member Jesse Evans and his gang were also were enlisted by Murphy-Dolan faction. 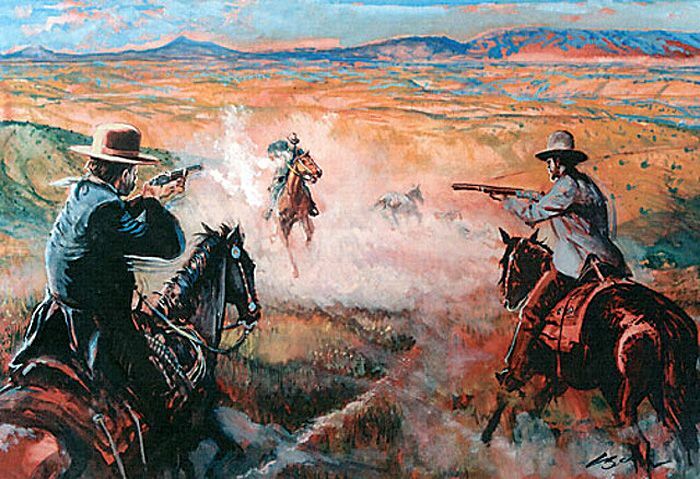 Once the Lincoln County War was over, most of the gang members returned to Dona Ana County and their profitable cattle rustling activities. However, a few of them remained and joined up with another gang called Selman’s Scouts and others joined the Jesse Evans Gang. The remaining members resumed their criminal activities in Dona Ana County until John Kinney was arrested in April 1883. Convicted of cattle rustling, Kinney spent the next three years in prison, and by the time he was released in 1886, his men had scattered. After he was released, Kinney did not return to his former outlaw life but rather, served in the US Army during the Spanish–American War, and lived until 1919.